Prior to colonisation, the Bunya Mountains was a place of large gatherings of the Aboriginal people of South East Queensland for the ‘Bonye Bonye’ festival; a time of feasting, ceremony, trading, betrothals and the settling of disputes. In years when there were heavy crops of the nutritious bunya nuts (from the native Bunya Pine, Araucaria bidwilii), invitations from custodians went out to groups towards the coast and to people as far away as the Clarence River in northern NSW and the Maranoa River over 350k to the west. Festivals took place from December to March and the last big recorded gathering was in the 1880s. 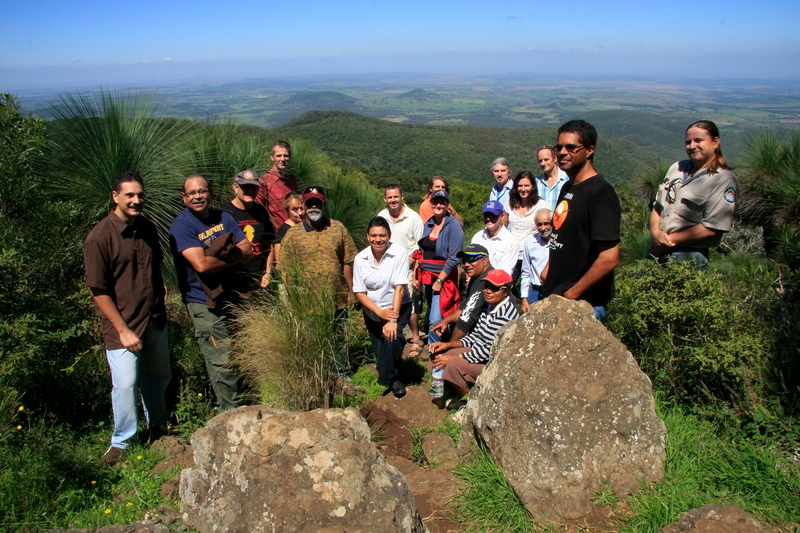 In August 2008 the first of a series of Stakeholder Forums were held on the Bunya Mountains of SE Queensland to discuss natural and cultural resource management issues and to explore ways for the Murri people of South East Queensland to become more actively involved in planning, research and on ground management of lands in the Bunya Mountains region. Traditional Custodians from about twelve groups met with scientists, Government and Non Government Organisations and business representatives and as a result the Bunya Partnership Coordination Group (BPCG) and the Bunya Elders Council were formed to create Natural and Cultural Resource Management opportunities for Traditional Custodians. Stakeholders on Mt Kiangarow (1126m). Australian Government funding was secured to develop a Caring for Our Country Action Plan for the Bunya Mountains. The plan was published in late 2010. In September 2009, a bid to the Australian Government for the Working on Country program was successful. This project is called the Bunya Mountains Murri Ranger Project. The project has employed 4 Indigenous Rangers, a Coordinator Ranger and a part time Administrative Assistant. The group is working collaboratively with Queensland Parks and Wildlife Service on the Bunya Mountains National Park and the Western Downs Regional Council on Russell Park. The Bunya Mountains support a unique assemblage of plants, animals and ecosystems and have been likened to an island of biodiversity surrounded by an ocean of plains of mainly cleared farmland. They are a biodiversity refuge, harbouring ancient species, distinct plant and animal communities and more than 30 rare and threatened species. One hundred and nineteen grasslands, known locally as “balds”, are dotted across the Bunya Mountains. These balds have important cultural significance as they were maintained by traditional burning practice. 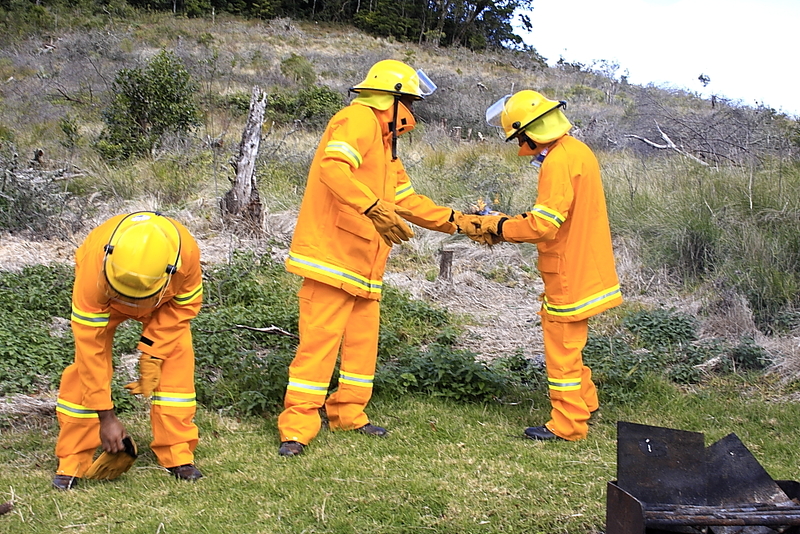 The first traditional burn in 100 years; Bunya Murri Rangers 2010. A large component of the project involves the management of fire on the grasslands through experimental burns of varying frequencies and intensities. Researchers and rangers are working to find the right fire regimes to maintain the open character and species diversity of the balds before they are lost forever. This entry was posted in Fire Ecology & Management, Indigenous land & sea management, Planning, monitoring & assessment, Queensland, Threatened species & communities. Bookmark the permalink.